Just a quick note to get you all in the mood for a good few days of probable kiting ahead. SeaBreeze is a little flakey tomorrow but the BOM forecast reads like a dream. East to northeasterly 10 to 15 knots turning northerly 15 to 25 knots in the late evening. Winds reaching up to 30 knots in the evening. Around 1 metre, increasing to 1.5 metres during the morning, then increasing to 1.5 to 2.5 metres around midday. North to northwesterly 15 to 20 knots shifting southeasterly in the middle of the day. Winds reaching up to 25 knots offshore early in the morning. 2 to 2.5 metres, decreasing below 1.5 metres during the morning. Southerly below 1 metre, increasing to 1 to 2 metres during the afternoon. Southeasterly 15 to 20 knots turning southerly 15 to 25 knots during the morning. Around 1 metre, increasing to 1.5 to 2 metres during the morning. Right now Kurnell is turning it on with a green arrow, and we’ve just hit yellow at North Head. 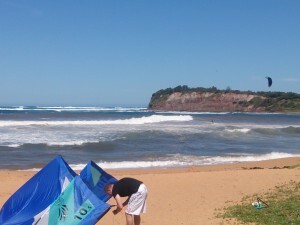 I’m sure the Northern Beaches will get wind today, temps are not that high and it isn’t a true sea-breeze. Surf should build too and there is a good little wave out at the moment so the surfers should be happy. Watch out for beach goers, it’s PACKED on the beaches, now is a good time to get your insurance from Australian Kiteboarding if you haven’t already. They have just emailed an update to the insurance policy.. Go and check it out WooHoo..